Mitochondria are recognized as essential for both life and death fates of cells. Mitochondria are the site where oxidative phosphorylation happens, the process that is responsible for the majority of energy production of the cell in the form of adenosine triphosphate (ATP) synthesis. Therefore mitochondria are considered as the main power station of the cell. On the other hand, both apoptotic and necrotic cell death may result from mitochondrial perturbation . In cancer cells, mitochondria are different from those of normal cells by several aspects: (i) In cancer cells the mitochondrial membrane potential is higher than that of normal cells, (ii) there is expression modulation of permeability transition pore complex (PTPC) components which include the voltage-dependent anion channel (VDAC), the adenine nucleotide translocator (ANT), and cyclophilin D, and (iii) there are enhanced rates of glycolysis even in the presence of oxygen, a phenomena that is known as the Warburg effect . In fact, many chemotherapeutic drugs induce mitochondrial-mediated apoptotic cell death (intrinsic apoptosis pathway) and act via mitochondrial perturbation, causing mitochondrial membrane permeability transition (MPT), membrane depolarization, osmotic swelling, and release of cytochrome c leading to cancer cell death. Hexokinase (HK) is the initial enzyme of glycolysis that catalyzes the phosphorylation of glucose to glucose-6-phosphate (G6P), which is also the rate-limiting step in glycolysis and sequesters glucose inside the cells. In cancer cells, HK (mainly HK-II) is overexpressed and found mostly bound to mitochondria through VDAC1 . An enhanced expression of HK is found in aggressive tumors such as gliomas , and hepatomas . HK overexpression, along with its glucose phosphorylation activity, is suggested to play a pivotal role in cancer cell growth rate and survival . Thus, mitochondrial-bound HK overexpression may contribute to the Warburg effect by facilitating the access to ATP, the substrate of HK . In addition, as one of the hallmarks of cancer  is evading apoptotic cell death, owing in part to overexpression of anti-apoptotic proteins of the Bcl-2 family and that of HK, the elevated levels of mitochondria-bound HK in cancer cells contribute to the protection against mitochondria-mediated cell death . All together, these characteristics make HK attractive target for cancer therapy. The jasmonates plant stress hormones aside from their natural function against microbial pathogens in plants were also discovered to have toxic activities towards mammalian cancer cells. These activities consist of two important characteristics for anti-cancer drugs: high selectivity towards cancer cells, and the ability to act against drug resistant cancer cells . The main mechanism of action of jasmonates–induced cancer cell death is suggested to involve direct mitochondrial perturbation. Methyl jasmonate (MJ) is able to reduce intracellular levels of ATP in various cancer cells, preceding cell death induction. Thus, the impaired ability of cancer cell mitochondria to generate ATP renders them more sensitive to the rapid ATP depletion induced by MJ. 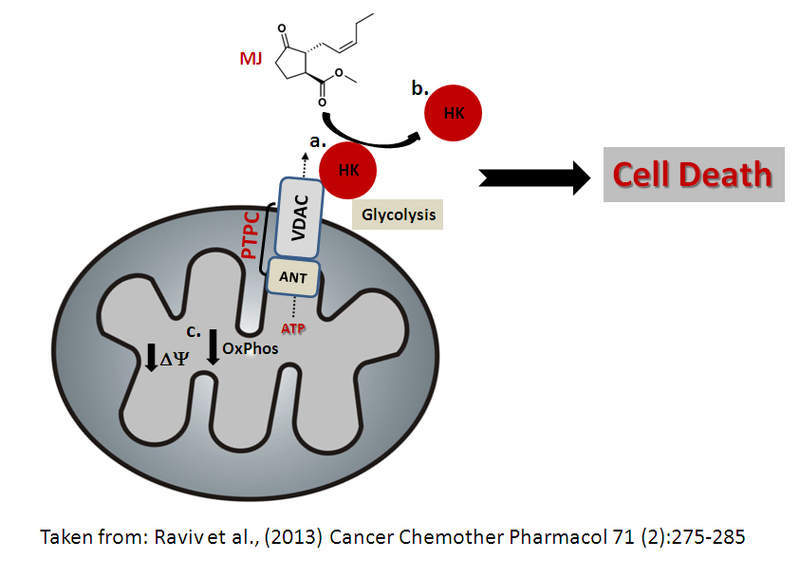 In addition, MJ induces mitochondrial membrane depolarization and cytochrome c release in cancer cells, as well as swelling and cytochrome c release in isolated mitochondria derived from cancer cells in a PTPC-mediated manner, but not of normal cells . These findings demonstrate that the jasmonates selective toxicity towards cancer cells relies on the differential mitochondrial status of cancer cells vs. non-cancerous cells. Most relevant, it was clearly demonstrated that MJ binds specifically to HK and disrupts its interaction with mitochondrial VDAC1, leading to detachment of HK from the mitochondria followed by cytochrome c release and subsequent cell death . The direct interaction of MJ with HK was demonstrated using real-time surface plasmon resonance (SPR). In addition, it was demonstrated that the susceptibility of cancer cells and mitochondria to MJ depends on the expression of HK and its mitochondrial association . Therefore, MJ-induced HK detachment from mitochondria perturbs mitochondrial permeability and induce overall cellular energy crises, leading to cell death (see figure). Jasmonates thus describe for the first time of a cytotoxic mechanism based on direct interaction between an anti-cancer agent and HK. This finding may stimulate the development of a novel class of small anticancer compounds that inhibit the HK-VDAC1 interaction . As described above, the HK association to mitochondria in cancer cells mediated through VDAC1 . It has been shown that HK–VDAC1 interaction prevents induction of apoptosis in tumor-derived cells. Thus interfering with HK binding to VDAC1, promoting detachment of HK would form the basis for novel cancer treatment. Two main classes of agents might affect the HK-VDAC1 association: inhibitors of HK activity, or compounds that compete with VDAC1 for HK binding. Detailed studies were performed in order to elucidate the domains on VDAC1 sequence that are essential for its interactions with HK. These studies were based upon VDAC1 biochemical/functional structural prediction and the recently elucidated VDAC1 3D structure. By mutagenesis and functional studies, suspected domains on VDAC1 were examined as for their role in VDAC1-HK interactions . According to these studies selected cell-penetrable VDAC1-based peptides were designed and were demonstrated to directly interact with purified HK in vitro and to detach HK bound to mitochondria isolated from tumor cells. Not only that, it was clearly demonstrated that these peptides are capable to selectively kill cancer cells while spearing normal cells , all together supporting the notion that interfering with the binding of HK to mitochondria by VDAC1-based peptides indeed may offer a novel strategy by which to induce selective cancer cell death. In order to evaluate the potential of using the HK-mitochondrial interactions as valid targets for cancer therapy, more steps are needed to be taken on the road. The selectiveness of this therapy relays on the fact that cancer cells bare much more mitochondrial-bound HK than normal cells, which might serve as an Achilles heel of the cancer cell. As peptides could be easily degraded in the plasma, the VDAC1-based peptides efficacy against cancer should be evaluated in vivo as well as their plasma stability should be examined. New generation and formulations of VDAC1-based peptides should be developed based upon research progress. As for jasmonates, their main deficiency is the need of using relatively high concentration (at the range of millimolar) to exert their action. Therefore, in order to develop valid jasmonate-based therapies, there is an urgent need for the development of jasmonate analogs that actually work in much lower dosage, with increased solubility, yet still effective and potent against cancer. Furthermore, it is not clear yet what is the exact domain on HK that MJ is interacting with. Elucidating the plausible interaction site(s) of MJ with HK would give the opportunity to design other small molecules directed to that specific HK domain with the hope to achieve more effective anti-cancer agents. 15. Arzoine L, Zilberberg N, Ben-Romano R, Shoshan-Barmatz V (2009) Voltage-dependent anion channel 1-based peptides interact with hexokinase to prevent its anti-apoptotic activity. J Biol Chem 284 (6):3946-3955.